There was a post I read online one time that said, “you know school stopped being fun when Elmer Glue, water paints, and crayons stopped being on the school supply list.” It’s true when you think about it. Don’t you have more fond memories from your childhood than you do of your days as a teenager? It was easier to make friends in elementary school all you had to have in common was a favorite color or food and you were instantly buddies for the rest of your school days. The days of being an adult are completely different. You can no longer make friends as easily by walking up to people asking if you can borrow their glue. Some people instead will take the 5 mile trip to wal-mart or office depot and buy their own instead of looking foolish in front of someone for asking. (Many introverts do suffer from this condition everyday and they will go out of their way to get one small thing than risk looking like a fool in front of someone when all they have to do is ask.) I think this is why so many childhood TV shows and movies are making a comeback because they remind us of how much fun we used to have growing up (plus the audience numbers are already there) and how the world looked so innocent and nice. There are many things you can bring back from your elementary school days and turn them into full-time passion projects that can make money today. Remember playing in the sandboxes and how they were so much fun at school with your friends? It was the experience of playing with your friends that made it all the more fun. What about when you used to play with water paints and create funny pictures on large pieces of paper on the wall well now there are businesses that cater to this whole new idea for adults. Take a look at the company IdeaPaint, where you can paint any wall and turn it into a dry erase board. That is a lot easier than having to install huge boards in your office, classroom, or home. There is a restaurant called Pinot’s Palette and they took the whole idea of painting and turned it into an evening experience. The idea behind this place is that you come in with a group of friends and paint on a canvas and drink (BOYB). The reviews online paint this place as a way to experience art and food and fun all at the same time. Why is this business taking off and why not just join a regular painting class in college? Well the reason for that is this place provides a more relaxed atmosphere whereas in college, yes you will learn the technical stuff, in this program you won’t be graded on anything and you don’t have to follow a certain style. You just can paint, eat, and drink and enjoy your time with friends. That is a lot more enjoyable for a night out and you get to take what you made home with you. Another concept art idea that went viral was the backpack that looks a comic book drawing. 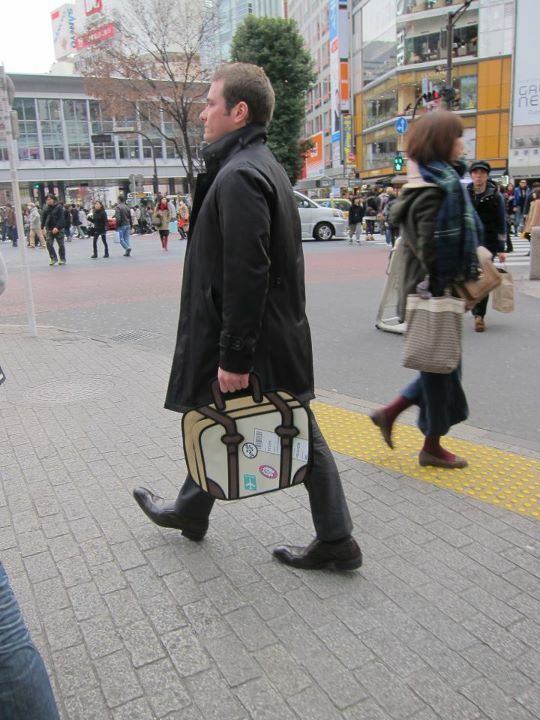 The pictures of the handbag and backpack looked like it was just a photoshop joke but they really do look like that. This is what made them such a viral hit on twitter (#thebag) and all over. People liked the fact that they were wearing something that looked like a visual illusion. You can check out their website, Jump From Paper, and see what other cool things they have made. What if we look at some other ideas that seem a little far stretched but when seen in reality are totally believable. 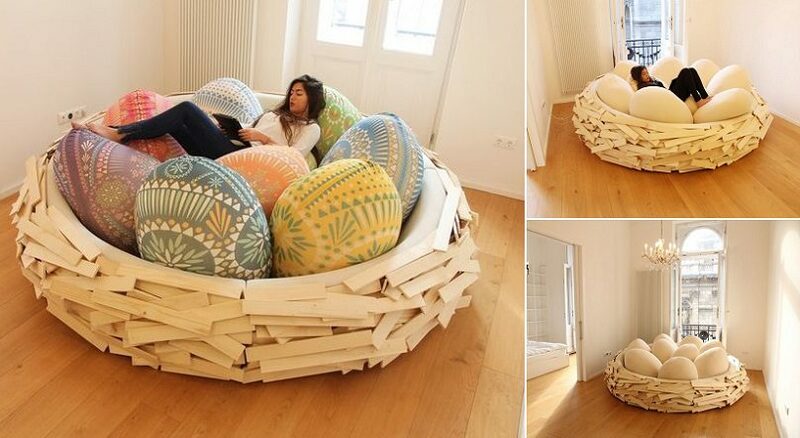 In this instance why not consider, instead of a day bed, relaxing in a giant bird’s nest. You can see just how comfortable something like that might be. The whole idea behind this nest, what some might call crazy or ridiculous, is to create a place for you to get away and think or relax or just chat with friends. The bird nest comes in different sizes, the 2-3 people nest goes for a price tag of $3,591 and the 16 person nest has a lightweight price of $10,774. The nest really acts as a place for inspiration which is a great idea because your environment says so much about your thinking habits and what you do. Check out there website to learn more about them. If you want to think in a new way you have to find a new place to be in otherwise your mind will not have any new stimulus coming in. It needs new things in order to create new things, this is why people who work at home eventually go stir crazy from seeing the same thing over and over. Maybe playing on playgrounds for adults might be the thing you need to help get the creative juices flowing again. You can see how this market of taking kid ideas and turning them into toys for adults is becoming a huge industry with these 42 ideas that adults wish they had and probably do. So why the sudden interest and what other ideas are coming around that seem to be getting a lot of attention? Coloring, for so many people, is a very personal and fulfilling way of spending their time. Many people remember back in elementary school when they were given time in class to color. This was probably everyone’s favorite time right after nap time with the milk cartons. Everyone was told that the most important rule in coloring was to stay within the lines which, surprisingly enough, was still a challenge for many. I loved this activity and was damn good at it. My thing was to always trace the outline first, since that was how the teacher taught it in class and pretend that the trace were the borders not to cross. I would trace hard to make a bold line and then color softly within those lines. That method earned me a couple of 100s as I remember. It might surprise you to learn that the activity is still alive and well for adults today. The lives of adults is filled with a constant flow of activities and responsibilities. There are many activities that take the part of slowing down and enjoying lifee but none so much as the act of coloring. Yes there are anatomy coloring books, which many enjoy coloring just for fun, but now there is a new market popping up showing a healthy growth of interest. Secret Garden and Enchanted Forest are two of the latest books to hit the market geared towards adults who enjoy the art of coloring. The artist, Johanna Basford, has said that it was surprising to find the reception her books have had with people. The reviews on amazon have all been 4 and 5 star ratings with people saying that her latest book, Enchanted Forest, beat expectations. You can also see that they are very popular in other languages, even though the book is mostly just drawings on each page, something to take notice of when creating your product or service. Many people have ordered more than one copy in order to test out different styles of coloring on the same image. But why did this take off? Well, one, it helped to have an influencer in the mix. If you have kept up with this blog then you know that most big breakthroughs happen when an someone of importance, or celebrity status, tweets or posts a photo about discovering someone’s work and all their followers spread the news. This happened when Korean pop-star, Kim Ki-bum, posted a photo on his instagram showing what a great job he did coloring in his flower wreath. It was that photo that got other people interested in learning where he got that coloring book from. The crowd in South Korea took quickly to the idea of adults and teens coloring for fun and why not, its different, you can express yourself, and share it online with your followers. That is exactly what the experience of coloring should be about, expressing yourself and sharing it with others. Many places all over the world are putting together coloring groups which has shown to have a positive reception. The idea of coloring by hand helps increase focus, creativity, and imagination, and for older adults, hand-eye coordination. Johanna’s luck has been all about people discovering her work. The first time it happened was when a publisher, Laurence King Publishing, found her work online and thought she would be able to find a market in children’s books. Johanna approached her publisher about doing coloring books for adults but they were hesitant at the idea that adults would enjoy doing something that they thought is really just for kids. This was the second reason why this new trend took off. If not for her push to create something she enjoyed doing, and was different, then there would not be a renewed interest in adult coloring books. The work Johanna has created is different from all the other adult coloring books out there because her patterns are more intricate than the standard adult coloring books. Most are not as detailed as Enchanted Forest or Secret Garden which allows a richer, creative mind to develop. Her illustrations are from pure imagination rather than just standard form as coloring in animals, which you already know the colors for, so it is hard to come up with your own. Her books allow your mind to flow and find new patterns or color designs to work with. How she got to where she is today is all history now that she has amassed a huge following, not to mention, gotten more followers on her twitter account because of her recent NYtimes article. Now she has had three influencers in her life to help push her work into the mainstream, Korean Pop star, her publisher, and the nytimes article. If she keeps putting out work like that and coming up with more creative ways to color then she will have a very fulfilling and lucrative career as an illustrator for coloring. One of her past jobs was creating beautiful wallpaper designs for hotels so maybe she will be asked to do that again. According to the feedback she has gotten from fans, the next coloring book she is working on now will be of the ocean. If you would like to see other people who have done adult coloring books you can check out the following below. The example this article provides is that you don’t have to rack your brain trying to come up with something completely original you just have to find a new way of doing something that has already been done before. She put in many hours trying to come up with concept art to show to her new publisher that what she wanted to do was worth putting there. She still had to work to earn money which she did as a freelancer during the day but now that she has built the following she has now she can spend more time creating the things she enjoys. Whether you are trying to build an app or improve a new service, look for the little habits that a lot of people over look just because it might seem “childish,” it might turn out that is exactly what people are looking for. This entry was posted in Business and tagged #thebag, adult coloring books, adult playgrounds, childhood ideas made real, coloring books for adults, Coloring Books for Grownups, creative business ideas, creative entrepreneurs, entrepreneur, follow your passion in business, giant birdnest, illustrators, improve old ways for today, johanna basford, jump from paper, jump from the paper, kid activities made for adults, kid toys for adults, laurence king publishing, naturescapes coloring books, passion turned professional, pinot's palette, startup ideas on April 6, 2015 by Chris. Hi, my name is Chris. I'm an entrepreneur and have been one all my life. I teach, inspire, and get others to think differently about everything around them. I put together this website all the things that catch my attention and feel are important to know. Feel Free to share with others. If you have a question, shoot me a message! Does Your School Hinder Creativity?